If you’ve attended our Cloth Diapering 101 class, or been into the store and received the low-down on washing cloth diapers, you probably already know that it’s recommended that you be very careful with your cloth diapers when it comes to dryer sheets. Never, ever use a dryer sheet or dryer bar in the dryer with your diapers or diaper covers. Any fabric softener, including these two types in the dryer, or liquid fabric softener in the washing machine (including as an ingredient of your detergent) will leave a film on your diapers and covers that reduces and eventually stops absorbency, and will cause your covers to leak. I learned this the hard way! If your covers leak right through as if they are not waterproof at all, this is most likely your issue; though it’s important to note that even if your diapers aren’t doing this, you may still have build-up from fabric softeners. Other symptoms include reduced absorbency; stay-dry lining that repels moisture (instead of letting it soak through to the insert); and diapers that smell “funky.” If you suspect you may have a residue issue, please refer to Bummis’ Residues Troubleshooting Page. Liquid fabric softeners are not as much of an issue, because the answer is simple – just never allow liquid fabric softener to enter the washing machine with any components of your cloth diapering system. This means also using a detergent that does not contain fabric softeners (even soy softeners and other natural softeners). 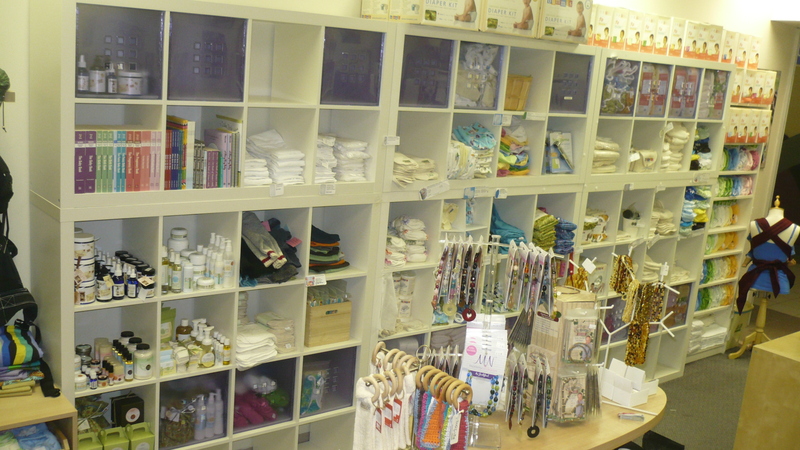 Our full selection of cloth diaper options. Using Dryer Sheets or a Dryer Bar and Concerned About Your Cloth Diapers? This fatty film stays on the inside of your dryer for at least a load or two after the sheet or bar was last used, so if you plan to continue using these products on your regular laundry, we recommend running a load of towels through your dryer on the h0t or high setting without a dryer sheet or bar, prior to drying your diapers. Another way around this issue is to consider always or usually line-drying your diapers. At the very least, line-drying covers makes sense, as they do not absorb water and dry very quickly once out of the wash. Line-drying will also greatly prolong the life of any Aplix closures on your diapers and covers. Most diapers will dry overnight or in about 6-8 hours, depending on the time of year, and the relative humidity and temperature in the area where they are hanging to dry. Calgary’s dry climate and abundance of sunshine pair well with line-drying laundry of all types. Please note that all-in-one diapers do take a fair bit longer to dry – often in the 12-24 hour range, depending on the type and brand. Other advantages of line-drying? If you’re hanging your diapers inside to dry, they will humidify your house as they dry; if you’re hanging outside to dry, you can count on the magic of sun-bleaching to get your stains out! Dryer sheets cause a coating on clothing and therefore will cancel out the fire retardancy of clothing. Dryer sheets are not recyclable nor reusable – the only option is to send them to the landfill. That lovely scent they leave on your clothes? It’s tough to part with the idea of the “fresh laundry” smell, but consider this: that scent is thanks to “fragrance,” a blanket term for synthetic chemicals that have been linked to a whole host of issues, from asthma, to skin irritation and headaches, to brain damage in developing fetuses and much more. Fragrance also contributes to indoor air pollution, and contains toluene. Fabric softeners, either liquid or in the dryer, are designed to reduce or eliminate static in synthetic materials and serve no purpose with natural fibres. A great place to check for more information on the ingredients in fabric softeners is The Less Toxic Guide. For ratings of different fabric softeners from least to most toxic, try The Good Guide. Carbon fibres woven into a piece of fabric absorb static electricity – these are known as dryer cloths. Dryer balls (available in different materials) used in sets of two or more, bang together and against clothes, using force to expel static electricity. These come in plastic varieties or wool. The latter seem to last indefinitely and many people feel they are more gentle on clothes. We carry wool dryer balls at Babes in Arms. If you don’t have a top-load, I’d recommend visiting someone who does — it will make the rinsing process so much easier. (3) Soak your diapers for a few hours (I wait until the water is cool enough to stick my hand in comfortably). (5) Do a 2nd HOT wash with your regular detergent (I use 1-3 Tbsp of Rockin’ Green Hard Rock) AND a few drops of the Grapefruit Seed Extract. (6) Do a double rinse, both hot. (7) Ideally, you should to do a full sun dry (UV rays help kill the yeasties), but in winter, you could use the hottest setting your dryer has, & dry COMPLETELY. Do your diapers smell fine when they’re clean but stinky after the first pee? Does your child have a red bum (mild rash) everywhere after a wet diaper? Both are signs of ammonia build-up (also known as urine residue). * For me, once I do a heavy soap wash (I recommend Rockin’ Green’s Hard Rock for Calgary’s hard water) followed by multiple (3-5) hot rinses & a hang dry in the sun, it usually eliminates the problem. * Another thing to try is bleaching your diapers. While we don’t recommend this on a regular basis, you can use an oxygen bleach (such as Oxy-Boost or Nature Clean Oxygen Bleach) to get rid of stains (but no more than once every month or so). (1) I use a top-load washer. Top loads use more water and therefore rinse diapers more thoroughly. You can use a front-loader, but you may find you need to “trick” it into using more water, or you may need to do an extra rinse or two. (2) I use a magnet ball in my machine. Don’t ask me how it works, but it does — it somehow changes the calcium molecules so that the water isn’t quite as hard. To me, it’s magical… & a key part of my washing routine. (3) I do a cold rinse to help prevent any stains from setting. (4) I wash my diapers (in hot) with a heaping Tbsp of Rockin’ Green Hard Rock (which is formulated to help with hard water — I think the secret ingredient is sodium percarbonate). I usually let them sit for at least 20 minutes in the water & detergent before spinning them out. (5) I do a double rinse. Usually, I just start my cycle over after the diapers have first been washed — this means it ends up being a hot rinse then a cold rinse. (6) About once every 4-6 weeks, when I do my wash, I use 3 Tbsp of the Hard Rock detergent & let it soak for over an hour. One these days, I do yet another extra rinse. That’s it. That’s how I keep the ammonia away. My biggest comment to people with ammonia is “Use MORE detergent!” We’re always told to use less detergent when washing diapers, but sometimes we get a little too cautious. With water as hard as it is in Calgary, it’s difficult for the detergent to work effectively, so we need to use more. A quick note: You can buy both the Rockin’ Green detergent & the Magnetbal at Babes In Arms, although that’s not why I mentioned them — they really are amazing products! Happy Canada Day! Free Babylegs With Any Carrier Purchase!